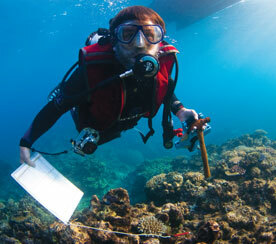 Josh completed his Ph.D. in 2004 on reef coral biomechanics under the supervision of Sean Connolly and Terry Hughes. He then spent four years as a postdoctoral researcher at the National Center for Ecological Analysis and Synthesis in Santa Barbara (California), where he pursued a range of questions in areas including paleoecology, ecoinformatics, and mammal and reef fish biogeography. Josh recently returned to Australia to take up a lectureship in the Department of Biological Sciences at Macquarie University in Sydney. Increasingly severe storms and weaker carbonate materials associated with more acidic oceans will increase the vulnerability of reef corals to mechanical damage. Mechanistic predictions based on measurements of colony mechanical vulnerability and future climate scenarios demonstrate dramatic shifts in assemblage structure following storm disturbances, including switches in species’ dominance on the reef and thus potential for post-disturbance recovery. 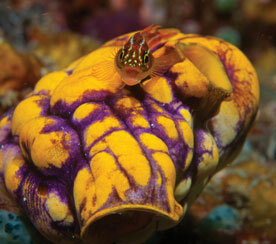 It is known that larger colonies are more resistant to factors such as disease and competition for space and complex morphologies support more associated reef species. However, future reefs are expected to have lower colony abundances and be dominated by small and morphologically-simple, yet mechanically robust, species, thus allowing them to support lower levels of whole-reef biodiversity than do present-day reefs.